2D Toolkit has been integrated into Unity 4.3 - updated to use the new Undo system, 2D physics and sorting layers. For the most part, the transition will be transparent to the end user. You can mix and match Unity and 2D Toolkit sprites, colliders. Switching physics engines is pretty straightforward, but some care needs to be taken. 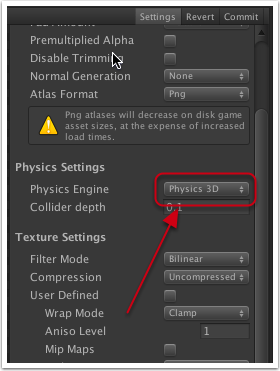 Use the following steps to transition from 3D -> 2D physics, or vice versa. Remove all Rigidbody / Rigidbody2D or other physics components from your scene - you don't have to worry about colliders generated by 2D Toolkit. Unity will not allow switching colliders when an incorrect rigidbody, joint, etc is attached to the game object. Hint: Use "t:Rigidbody" in the hierarchy window to find all rigidbodies quickly. Open your sprite collections in the sprite collection editor, switch physics engines and Commit. That should be it! All colliders in your scene should have been converted. You can now re-add the appropriate rigidbody components and modify your code accordingly. If you'd like to test this out before attempting it on your project - the tilemap demo will work with both 2D and 3D physics. You are not yet allowed to use Unity atlases on 2D Toolkit sprites and vice-versa. You can however mix Unity sprites with 2D Toolkit sprites / tilemaps / cameras - everyone plays nice with one another. 2D Toolkit UI currently only works with Unity 3D colliders. This will change in a future version. You may want to disable the 2D Toolkit gizmo and scene view integration. You may do this in the "2D Toolkit > Preferences" menu.